Did you know that not only do straight teeth look and function better, but that they actually stay healthier longer? Less plaque—the sticky, colorless film that causes tooth decay—collects around teeth that are properly aligned, and straight teeth are easier to brush and floss effectively. Furthermore, overbites (when the upper teeth protrude) make teeth more vulnerable to breakage during sports or other activities. By correcting these problems, orthodontics can help achieve a smile that is both healthy and attractive. Children commonly receive orthodontic treatment between the ages of 8 and 14. However, it’s never too late to get a straight, healthy smile. New advances have made orthodontic treatment faster and more convenient than ever before. There are two main types of orthodontic appliances: fixed and removable. Fixed appliances are bonded to the teeth and can only be removed by a dentist or orthodontist. 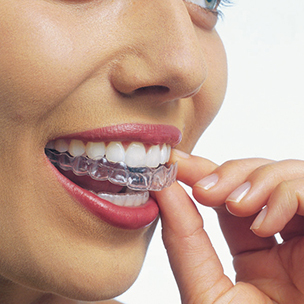 Choices range from traditional metal brackets and wires to discreet clear or tooth-colored braces. Removable appliances are those that the patient can take out of the mouth, such as Invisalign. The experts at Warshauer & Santamaria will be glad to guide you through the options available to you. Orthodontic treatment can typically achieve a straight smile in one to three years. Treatment is followed by the use of a retainer, a removable appliance that helps hold teeth in their new position. Good oral hygiene is especially important when you are wearing braces. Your orthodontist will instruct you for how to care for your teeth while you’re wearing braces. As always, regular dental check-ups and cleanings are recommended to keep your teeth healthy. Why choose Warshauer & Santamaria? Skill and technique on the part of the orthodontist are critical effective and comfortable orthodontic care. At Warshauer & Santamaria our doctors are specialists with years of experience in orthodontics. We will give you care instructions after each appointment. Good oral hygiene practices and regular dental visits will aid in the life of your teeth during and following orthodontic treatment. Feel free to contact us if you have any questions about orthodontics or to schedule a smile consultation with one of our doctors.